2016 is shaping up to be a historic election for President in the United States. Two of the most hated candidates in history were able to capture their respective party’s nominations and now the question becomes what next? Many major political pundits are actively hunting for an alternative to Donald Trump and Hillary Clinton, but what they are failing to see is there is already an alternative that will be on the ballot in all 50 states. His name is Gary Johnson and he is the former governor of New Mexico. Gary Johnson and the Libertarian Party have a real shot at changing the political game in 2016 and we can see that through the electoral college map we created. This map is a realistic analysis of the states that were chosen based on polling and trends that currently exist in these states. The west is a safe haven to Libertarian thinking and principles. The idea that people should be left alone is strong in the west and why Gary Johnson is playing well their right now in the polls. The anti-government sentiment is strong in the west particularly when it comes to land. We didn’t include Arizona into that mix yet partly because of Trump’s barrage on immigration. Colorado and Washington state especially might have a strong showing for Johnson in part because of their marijuana laws. In terms of freedom they are some of the most free states at the moment because of the decriminalization of marijuana. The upper New England area could bode well for Johnson, particularly in New Hampshire (spilling over into Vermont), where freedom is becoming quite popular with the Free State Project. There will be many that say “there is no way Johnson will win any state” but this is the election year that has given us Donald Trump and Hillary Clinton so anything is possible. This is dream math as far as Washington state goes. They are an even bluer state than California, so completely dominated by Democrats that the GOP often fails to put up a challenger for county and state offices. WA’s Electoral College votes are already Clinton’s to count on. Washington has some of the most libertarians in the country elected to city and town councils. That’s hopeful. In Jefferson County where I live, a life-long Republican had to register as a Democrat to facilitate his run for County Sheriff. (He won.) You would think that would be a non-partisan job. You should consider coloring Maine gold. Maine has a stronger history of victorious third-party candidates state-wide than any state in the US – including 4 Governors in our lifetime. I’d like to see Johnson win some states, but it seems like the objective of this map was the best “Stop Hillary” map that could be imagined. As mentioned by others above, I don’t see Washington as anything but blue under any condition. While Colorado as a whole may be relatively libertarian in spirit, there is no way Johnson pulls the raw number of votes it would take. When push comes to shove, Bernie will ensure that VT stays blue. I think the author is drinking a little too much of the kool-aid here. Johnson won’t win any high-population states, but could theoretically score in a few low-pop plains states like the Dakotas that won’t get much media attention from the major parties. I do agree that the map is a bit of a pipe dream to win all of those Mountain time zone states; however, I do think that the possibility of doing well enough in just a handful of small states could ensure that neither Trump nor Clinton get to 270. I think that the House of Representatives could realistically choose Johnson/Weld over Trump. The only state the Johnson-Weld ticket has a snowball’s chance in hell of taking from the Democrats is New Mexico. If that happens plus they pick off a few from the GOP column, then it comes down to Ohio. If that state goes blue, then the chances of keeping Sec. Clinton below 270 are exceedingly slim. The possibility that both establishment party tickets may end up with Ohio governors on them is emblematic of this. Absolute fiction. Johnson/Weld is a ticket intentionally targeting the Left/Blue. 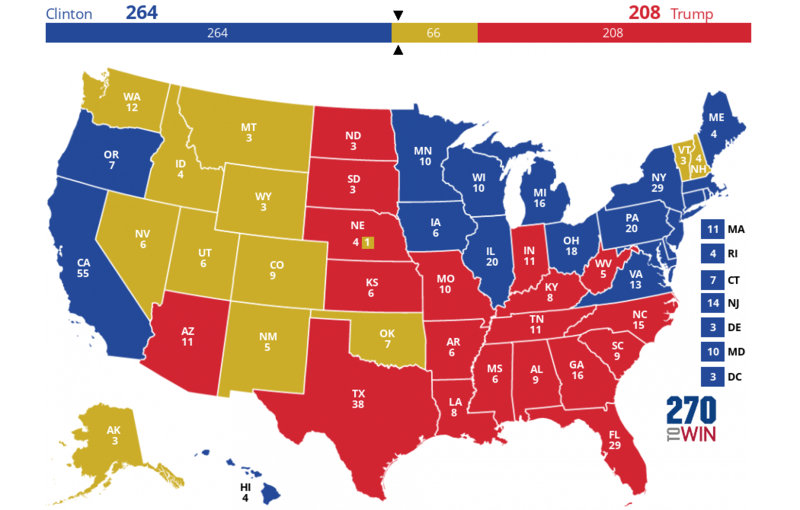 This map assumes normally Right/Red states get flipped LP/Yellow. Not happening at all. The Right rebelled against their party first, and it began years ago with the Medicare Part D and Gang of Eight. The culprits: RINO’s, Republicans In Name Only. Putting up two former Republican Governors thinking you’ll capture the Right while getting the Left using social Liberty is a complete miscalculation. The Right is finished voting for RINO’s, so the (R) on their resumes is actually a strike against them in Red states now Additionally, they are pro-choice which is the kiss of death to Right voters. From the Left’s perspective, the disaffected Bernie voters are huge government advocates. They already see the federal government moving their direction socially but will vehemently disagree with Johnson trying to wholesale eliminate departments. Johnson will be lucky to win NM. You guys had legions of people on the Right ready to vote for Austin Petersen. You screwed the pooch big time and absolutely punted on your largest ever opportunity to capture the White House. Complete and total failure. I don’t think this is the year that the LP can win the White House. It is the year of public awareness. If the LP can pull 15% or better in the popular vote (regardless of the electoral vote) it creates opportunity to expand the LP base. Yes, Gary Johnson will be presented as the standard bearer by mainstream media, but many people will find he LP through social media. On Facebook alone you will find pages for numerous groups of Libertarians: The Libertarian Catholic, Pro-Life Libertarians, LGBT Libertarians, state and county Libertarian groups, etc. Because we believe in freedom of association, people will see exactly how diverse points of view peacefully reside under the shared banner of freedom and tolerance. Yes, they will see internal debate on some positions, and in-fighting over philosophical purity, but the intra party conversation is ENTIRELY DIFFERENT from what they’ve seen in the major parties. This whole freedom thing might actually catch on. The analysis needs to consider the increased possibilty of success if Jill Stein can pull enough out of Hillary to tip say Ohio to Trump, say a Pennsylvania and Iowa. Then the Libertarian Blocking Gambit has a lower number of electoral votes it needs to win to hold both evils under 270. The Libertarians could try to broker the Electoral College, offering the Presidency first to the minority in the House in exchange for an acceptible candidate. The majority party in the House would be motivated to counter. If the EC deadlocks and we end up in the House only one the top three election finishers may be chosen under the 12th Amendment.